Rise and shine along with the sunrise as you loosen your muscles at Morning Tai Chi. Tai chi is one of the traditional Chinese martial arts. 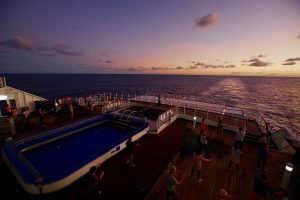 This event is very popular with everyone on board because of how good it feels to gaze out over the ocean and move your body in the morning. 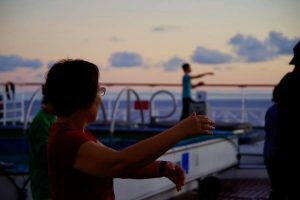 One of the on board participants Nashiki starts the day off with Morning Tai Chi each day. Nashiki, who used to work as a orthopedic surgeon, said that “Starting each day off by slowly moving your body is really good for your health.” Including radio exercises, nordic walking, and yoga there are many different activities for you to start the day feeling good with some exercise.